My 9 year old son, Parker, has always loved bug cars (Volkswagen Beatles). 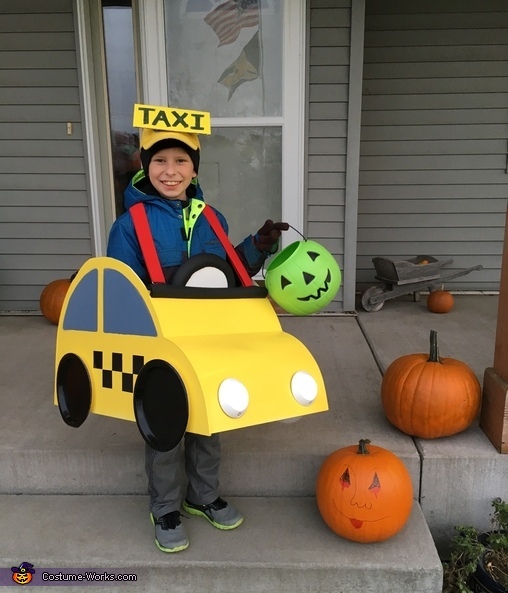 This year, he requested to be a taxi for Halloween. He wanted to make a taxi out of a cardboard box. My husband searched for DIY car costumes online. He found an idea that used a combination of foam and tag board. My son liked this idea, because it allowed him to draw the car any way he wanted. He decided he wanted to be a bug car taxi. We used Google to search for images of bug car taxis. My son drew the outline of a bug car on the foam board. After cutting it out, my husband and son folded the tag bird to make the front and back of the car. Then, they used hot glue to connect the pieces to form the car. Next, they spray painted the car yellow and grey. I helped with all of the details of the car. We used black paper plates for the wheels and steering wheel. We made the checkered design on the side and back of the car with squares of black duct tape. We used red solo cups to make the taillights and touch lights for the headlights. I used cardboard and markers to design a license plate. My son's name is Parker James. He goes by PJ, so we thought it would be cool if the license plate read PJ's Cab. A pair of suspenders was used to make the car wearable and my son wore a taxi sign on his head to finish off the car costume. The cost of the costume was under $25.